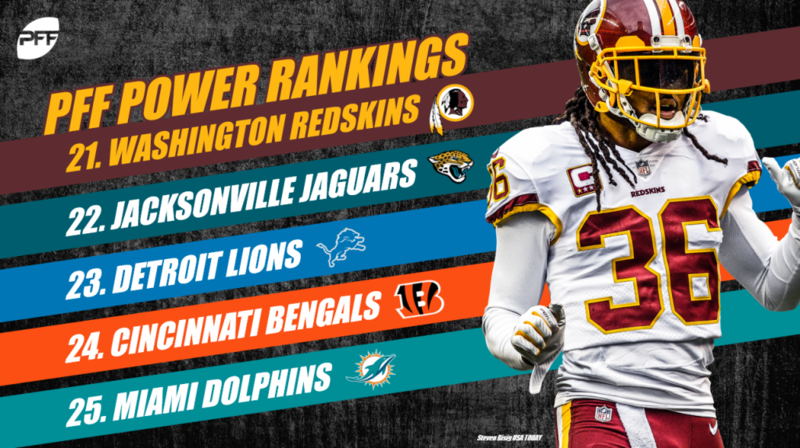 Week 15 continued to strengthen 2018 as a year for which we know very little about the league, especially up top. The top five teams in last week’s rankings had a point differential of -11, with three losing outright. The Saints demonstrated their ability to win “ugly” on Monday, registering 16 total pressures with four sacks and three pass breakups. Since week 10, they have stepped up defensively and allowed an average of -0.16 on their opponents’ dropbacks. New Orleans is all but locked into home field advantage (95%) in the NFC and is the clear Super Bowl favorite heading into Week 16. The Chiefs lost a roller coaster of a game to the Chargers on Thursday Night Football. This high powered offense wasn’t able to close out the game and move the ball when it mattered most. Patrick Mahomes continues to lead the MVP discussion and has posted 7.37 WAR. Defensively, they have one of the worst EPAs allowed when not generating pressure, something that will be magnified in the playoffs against the likes of Rivers, Brady and Brees. The Chargers check in at number three in our rankings (but the number one team from Los Angeles), after a thrilling come-from-behind victory over the Chiefs. The analytics say go for two after the first touchdown, so it’s tough to take a victory lap on this one, but it’s still encouraging to see coaches making aggressive play calls with the game on the line. Philip Rivers is playing the best football of his career, posting the second-best EPA per dropback in the NFL at 0.29. He now has a higher big-time throw percentage than Drew Brees. How the mighty have fallen! After looking nearly unbeatable through eight weeks, the Rams are now 3-3 over their past six games. Quarterback Jared Goff has the seventh-highest turnover-worthy throw percentage at 4.4%, and he has a middling aDOT with a low adjusted completion percentage at 74.6%. The Rams have an easy remaining schedule and should secure the other bye in the NFC (83%), but one more slip up could cost this team significant playoff positioning. The Steelers have put on their best Jekyll and Hyde display to close out the regular season. 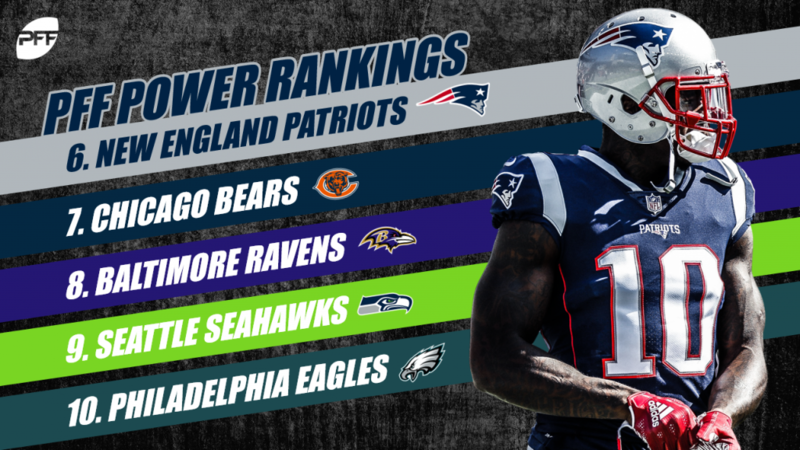 After dropping three straight, they turned in their best defensive performance in 2018 and beat the Patriots at home. 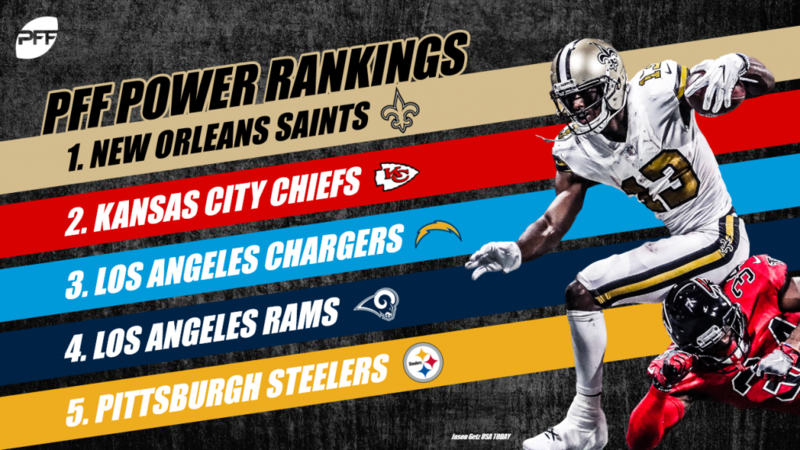 They will need more of the same as they travel to New Orleans in a game that they need to win if they want to feel good about their playoff chances. Big Ben has been barely adequate, posting 1.85 WAR. 15.4% of his pass attempts have received a negative grade, outside of rookie quarterbacks only Mitchell Trubisky and Ryan Tannehill have a higher percentage. After dropping another game on the road, the Patriots find themselves in serious jeopardy (50%) of not securing a first-round bye in the playoffs for the first time since 2009. With how poorly they have played away from Foxboro, this isn’t exactly reassuring in their hopes of returning to the Super Bowl. Tom Brady is sitting at the low end of “cluster-1” quarterback play and has posted the sixth-best WAR at 4.32. 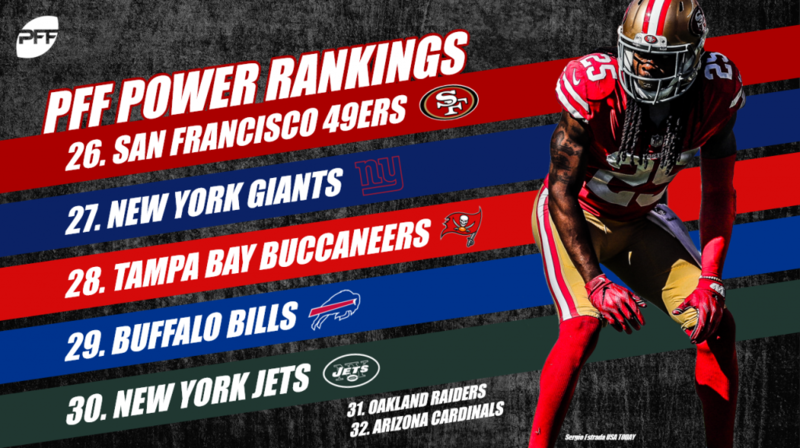 Defensively, the team has the league’s worst rate at turning their registered pressure into sacks, which is something that is unstable and should regress to the mean. There is a new king of the north, with the Chicago Bears securing the NFC North division title with a win over the Packers. Chicago has the league’s best pass defense from an EPA standpoint, allowing -0.11 EPA per early-down pass attempt with a 47% success rate allowed. The Bears contest passes at the sixth-highest rate in the NFL while also limiting yards after catch at the sixth-best rate in the NFL. 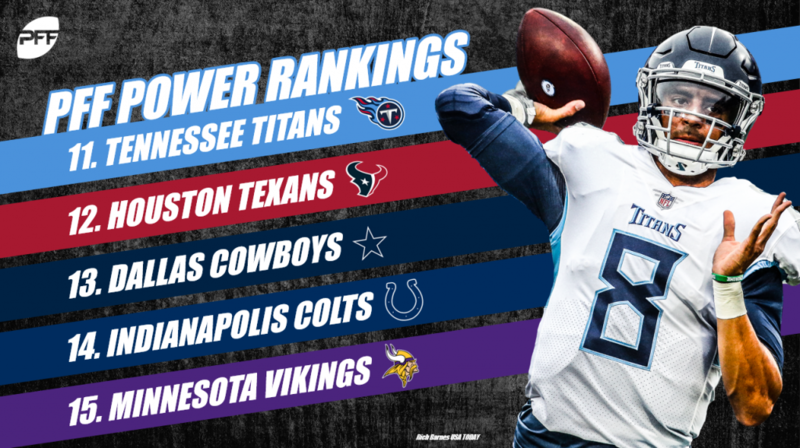 PFF doesn’t agree with the Bears faithful on how good Mitchell Trubisky is, but thankfully we have playoff football coming to alleviate those discrepancies. After grinding out a victory over the hapless Bucs, the Ravens travel to Los Angeles in a game they have to win if they want to make the playoffs. The Ravens have found the most effective use of Lamar Jackson’s talents in their game plan. Defensively, they are still one of the best in the NFL, especially against the run, where they have allowed a successful rush on only 35% of early-down attempts. Their pass-rush is scary and doesn’t leave their secondary at a disadvantage, as they have registered pressure at the fourth-highest rate when not sending an extra pass rusher. Russell Wilson failed to deliver fourth-quarter heroics, as the Seahawks finally dropped a game to the 49ers in overtime. The Seahawks are all but in the playoffs and can secure a berth with a Week 17 win over the Cardinals. Although interesting, this makes their matchup against the Chiefs this week much less dramatic. Wilson is eighth in our WAR metric, yet it still doesn’t feel like it captures how valuable he has been to the Seahawks this season. His 8.1% big-time throw percentage is the highest rate we have seen in three years. The Eagles kept their playoff hopes alive with a Foles-led victory over the Rams. Defensively, they played one of their best games of 2018, registering 18 pressures and allowing 26.0 passer rating with pressure. With a win over the Texans on Sunday, the Eagles will see their playoff odds rise to over 50%. Tennessee blanketed the Giants on the road, keeping their wild-card hopes alive for one more week. Marcus Mariota continues to provide middling play at quarterback, playing in the same EPA vicinity as Blake Bortles and Joe Flacco. It’s far from elite, but this defense and running game have the Titans believing they can still make the playoffs. With a week 17 showdown looming against the Colts, this is turning into a win or go home scenario for both teams. It took a comeback performance from Deshaun Watson and an exceptional performance Deandre Hopkins for the Texans to survive a scare against the Jets. With Hopkins playing at the best level of his career and making a legitimate case for being the most valuable non-quarterback in the NFL, the Texans still have a legitimate shot at a first-round bye. Deshaun Watson is also playing better than expected with almost 30% of his passing attempts receiving a positive grade. With a strong defense capable of generating pressure without blitzing, we may be lower than we should be on the team from Houston. Welp! Things came unhinged quickly for the Cowboys in Indy. They are still in the driver’s seat of the NFC East, needing just one win over their final two games to take complete control. Still, after a five-game winning streak, it is not encouraging to lay that big of an egg this late in the season. Since coming to Dallas in Week 9, Amari Cooper has a generated a 137.6 passer rating and an 88.3 receiving grade. The Colts flashed their winning formula with a dominant display over the Cowboys at home. Andrew Luck is playing some of the best football of his career under Frank Reich and currently sits fifth in our WAR metric (5.05). They have a successful early down pass on 53.2% of attempts which keeps this team in third-and-manageable. Defensively, they have faced the lowest average depth of target while limiting the depth on completions to the second-lowest rate in the NFL. They are keeping receivers in front of them and forcing check downs better than any defense in the NFL. The winner of their Week 17 matchup against the Titans will secure the final AFC wild-card berth. Mike Zimmer should be pleased with his team’s performance on Sunday, as the combination of Dalvin Cook and Latavius Murray finally got rolling. At home against inferior teams, the running recipe works, but on the road against a quality opponent, Kirk Cousins will need to perform better than his -0.01 EPA per dropback currently reflects. With two tough division matchups still to come, the Vikings need to win out if they want to control their playoff destiny. It will be back-to-back years that the Packers have failed to make the playoffs. As they start the search for a new head coach, the only remaining question is if Aaron Rodgers will finish out the season on the field or not. 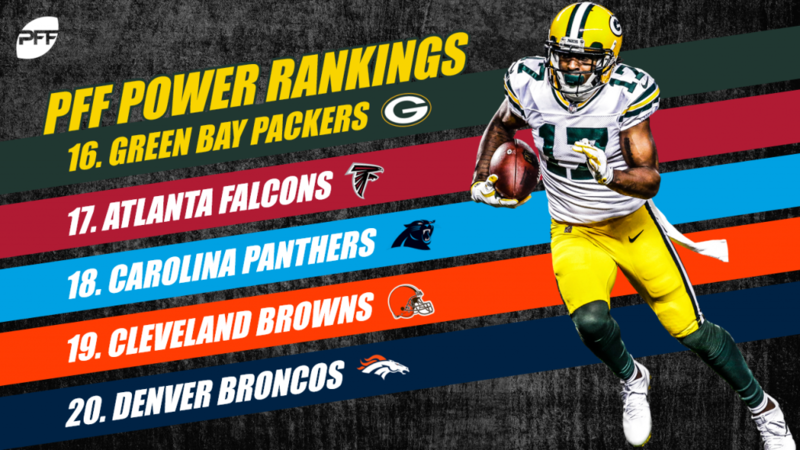 He is still the third-most valuable player according to our WAR metric, which means whichever coach gets the call from the Packers will have a significant leg up on almost every other team in the NFL. Our “positive regression” candidate that did not hit, the Falcons were frustrating on Sunday before they were eventually tantalizing, beating the Cardinals by multiple scores in what could be seen as their most complete effort of the season. Deion Jones has been great since returning, generating 16 stops in three games, while chipping in an interception for a touchdown and three pass breakups in coverage. The UNDER on Carolina’s win total (nine) was one of the more dead-in-the-water bets (at -140) through half of the season. Six-consecutive losses later, and the bet somehow hits with two weeks remaining. Christian McCaffrey has been a bright spot through this entire ordeal, generating the second-most WAR at the running back position, in large part due to leading the position group in yards after the catch. If they can figure out how to get Cam Newton healthy in 2019, their offense should improve enough for them to be a competitor (again) in the NFC. Winning a meaningful football game when Baker Mayfield doesn’t play well is a big step in the maturation process for a young Cleveland team. Their two top draft picks, Baker Mayfield (over three wins above replacement) and Denzel Ward (about three-quarters of a WAR) are the Browns’ two most-valuable players this season through 15 weeks. Jabrill Peppers and Myles Garrett are three and four, respectively, showing that this team is going to be a prominent team in the AFC for years to come. Another close affair for Denver ended in a loss to the upstart Browns, and that has left Denver out of the playoffs for the third consecutive season since their Super Bowl-winning 2015 campaign. However, it’s not for lack of a running game, which is averaging 0.02 EPA per early-down run (the only AFC team above 0.0). It’s been a combination of strange coaching decisions (see vs. Houston and vs. Cleveland) and quarterback play, where Case Keenum is generating -0.04 per pass attempt this season, for one of the worst marks in the league. That was quite an effort by the Washingtons, holding the Jaguars without an offensive touchdown and managing 16 points behind quarterback Josh Johnson, who got his first career win on the strength of his legs (50 yards rushing, 41 on scrambles) more than his arm (92 yards passing from a clean pocket). They have a tough road to the playoffs, but still, they have about an 18% chance. It starts Saturday against the Titans (-10). Our opinions of quarterbacks are (understandably) unstable and riddled with recency bias. You wonder if that’s the reason why we are still going to see Cody Kessler against the Dolphins this week and not Blake Bortles. Bortles, while he performed poorly this year, was still an above-replacement-level player for the Jaguars, with a turnover-worthy play rate (2.3%) that won’t kill you in winnable games against teams that are quarterbacked by players like Josh Johnson. Woof. While there was always something dissatisfying about Jim Caldwell’s 9-7 seasons in the Motor City, going multiple steps back without a clear path towards progress has to be tough for Lions fans to swallow. Kenny Golladay has been really enjoyable to watch of late, however, as he turned eight targets into 146 yards against a very good Buffalo defense on the road last week. Cincinnati got us over 5.5 wins last week, an event that I (Eric – the optimist of the PFF analytics crew) started to second-guess. Joe Mixon was very good, generating 129 yards on the ground (51 after contact) and salting away the game when the Bengals’ struggling defense started to let Oakland back in the game. Will the Bengals continue the course this offseason, or will we see some change in the Queen City? The Dolphins fell back down to earth in Minnesota, losing big while surrendering over 200 yards rushing to a Vikings offense that was previously incapable of generating anything on the ground. They still have a 6% chance to make the playoffs out of the AFC, despite what occurred in US Bank Stadium, meaning that if Ryan Tannehill can break out of a season-long slump and get them to victory the next two weeks against the Jaguars and the Bills, there’s a chance he can play in his first career postseason game in what has become a deep AFC. Nick Mullens has been one of the biggest beneficiaries of scheme so far this year, with 1.39 passing yards for every air yard thrown. George Kittle has been the league’s most-valuable tight end as a part of this process, generating 1.36 WAR while leading the position in yards after the catch by over 200 yards. Saquon Barkley was not a good value at two, but has been the 5-9 Giants’ second-most-valuable player in terms of our WAR metric (behind Odell Beckham Jr.) and the third-most valuable running back in the league behind Tarik Cohen and Christian McCaffrey. He leads all running backs in receiving yards, he’s second in receiving yards after the catch, and he’s first in tackles broken on receptions. The Bucs are going to miss the playoffs again (they haven’t made it since 2007), and while the combination of Ryan Fitzpatrick and Jameis Winston are the easiest pair at which to point the finger, their defense has been last in the NFC defensively where it matters most, allowing expected points on early-down passes. Some talent has emerged on that side of the ball, but it will likely take another offseason of acquisitions to bolster this group and help them contend in 2019. The Bills were considered the league’s worst team by a wide margin going into the year by some, but have had an impressive collection of wins in taking down the Vikings, Titans, Jaguars and Lions, all teams that finished 2017 with winning records. Throw in some game performances against Houston and Miami, and there’s certainly something to build on for Sean McDermott and this group. They’ll need Josh Allen (only 61% of air yards converted) to improve beyond being a scrambler in year 2, though. The Jets have played a bottom-five schedule in the league, something we foreshadowed before the season began, making their 4-10 start all the bit more disappointing through 15 weeks. Sam Darnold was good against the Texans, but is a Trubisky-like work in progress (to be the most charitable), generating -0.15 EPA pass attempt. It’s likely in their best interest to lose out, get the best pick possible, and recoup some of the draft capital they forfeited in the Darnold trade with Indy. As poorly as the outcomes of their games have been, the Raiders continue to play hard, fighting to within a score against a Bengals team on the road. They continue to be better than advertised offensively, generating successful early-down passing plays more than half of the time, while their defense has been the NFL’s worst in that department, allowing almost a quarter of a point per play. No team has fallen as far as the Cardinals since the start of 2016, falling a full 318 ELO points (where the mean is 1505) in that stretch. With a possible franchise quarterback and the number one pick in their sights, it will be interesting to see what is in store for this team this coming offseason.